Lusaka Province Minister Bowman Lusambo has challenged National Democratic Congress Consultant Chishimba Kambwili to desist from using insulting language against President Edgar Lungu. Mr. Lusambo has noted with regret that Mr. Kambwili has continued to disrespect the Office of the President by continuously insulting the President. Mr. Lusambo who is also Kabushi PF Member of Parliament said the PF will not take kindly the continued insults on the Head of State by Mr. Kambwili and his newly found partners, the Opposition Alliance. He said it is the duty of every Zambian Mr. Kambwili inclusive to respect the Presidency. Mr. Lusambo said no well meaning Zambian should rejoice in bringing the Presidency into disrepute hence the need for Mr. Kambwili to tone down. He said Mr. Kambwili’s outbursts in the media are a clear indication that he is not a patriotic citizen who thrives on lies to win sympathy from the Zambian people. Meanwhile Mr. Lusambo has challenged Mr. Kambwili to tell the nation where he took the railway infrastructure which has disappeared between Ndola and Luanshya. He accused Mr. Kambwili of having stolen the infrastructure to benefit himself at the expense of all the people of Luanshya. Lusambo is a Lunatic for Lungu!! Uuhhm nop. Mr. Lungu is doing a lot more to bring his name to disrepute than any person or organisation can ever do. Mr. Lungu’s own deeds testify against him. He will have the ignomy of being remembered as the weakest, most corrupt, most incompetent president Zambia has ever had. What a shame for him. And all for the love of money. Worse still, he is building his record before God, for which he must be judged on the final day. I fear for this man. I sincerely hope he will atleast have the sense and opportunity to repent before he meets his maker. Advising CK to shut it up is like sentencing him to his grave. It’s up to the people of Roan to figure out true leaders out of the winners and losers, out of the delirious and the serious. Is the Lusaka Minister and Kabushi MP Lusambo more civilized than the chap he slapped at parley, the disgraced faintizo king, jobless CK? All to play for in Roan Constituency until poll day. Lusambo the MMD die-hard who lead thugs to fight PF. Wonder if his entire gang joined PF or only gang leaders. It is not easy respecting someone that does not respect themselves. Lungu should listen to Dr Shishuwa and just become President if Singapore. He is not good for Zambia, he will just be arrested. But what is so difficult for the state to arrest Kambwili like they did to Sean Tembo and Siwale for defamation? CK HAS AN UNTAMED TOUGUE. EFYO AFYALWA UWA MUSALULA. ALIKULILILA. His own mouth costed him his seat at parley. BUFFOON CK was loud in PF and he is loud in opposition so what are you complaining about…unless there is truth in his utterances. Do you understand English though? 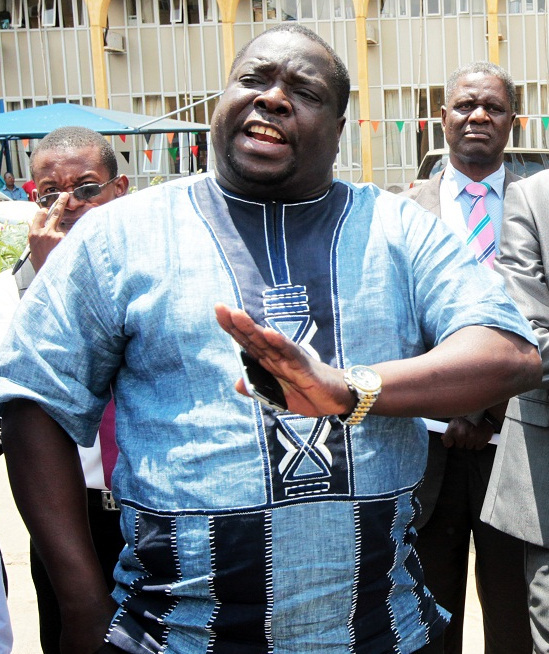 PF is Kambwili, his name will be fourth when history is written about who were PF members. Thorn in the flesh you write in Chibemba but you are querying whether people understand English. Finshi filecitika kanshi? These are wasted years indeed…so what is this former stone thrower for hire Bowman going to do? Are you going to arrest BUFFOON CK like you did to Sean Tembo? So long as we have such ill-educated foooolish cadres like Bowman who only know fists and can not debate you can never end violence. Paul was right in saying the love of money is a root of all kinds of evil. PF epitomize the love of money. They will readily watch everyone starve to death or of disease, as long as they get rich themselves. Shame. About the sack of money, that was in reference to the National Treasury not personal money. Can’t you people understand without someone unwrapping indirect speech for you? D’kap – why are you hiding your usual alias? People are not foooools or children who you connect with by jumping and dancing.I mean People have not been paid for months so what’s there to dance about? The national treasury is not his money or PF …but PF know no boundaries as evidenced by the rampant corruption. So if he stole the railway infrastructure, why is he free. This is question the president asked also. If you say he stole why is he not arrested . We are tired of politics of who talks louder than the other. We want phyiscal results now. How long shall we be entertained with politicians’s drama. We are not happy with just talk no action. Give us a break. Proud PF member. Both Lusambo and Kambwili are rotten seeds. All they do is incite violence. 2021 we need to watch these two carefully or else we shall lose our youths. Telling President Lungu that he is corrupt, does not mean he is being disrespected neither the office of the so called President. We can clearly point out what the President has obtained dubiously and we will ensure that one day he stands trial!! If Mposamabwe thinks that CK stole rail lines, take him to the police so charges can be prepare. Scandalizing his name towards the electorates won’t work. Come 2021, you will go back to Kabushi, ba Pompwe imwe!! Bringing presidency into disrepute…..let lungu deny that he is a corrupt thief. If it walks like a duck, quacks like a duck , it must be a duck. Politics of kissing the kings buttocks and bums. No wonder the president said he would not like ministers who cheat him. Most of these ministers are hoodwinks and cheats who survive on lies. We need ministers who will tell the president realities on the ground. It is pointless bootlicking the president’s shoes at the expense of developmental agenda. There is no morality and integrity in these politics which are being practiced. Most of members of parliament have sold their souls on the altar of expedience and shame. It is a big shame to the nation! The little respect they have, if all they have, has been eroded by their moronic behavior. Those are not insults but merely questions that need answers. If they were insults then he would have been arrested by this time. “Meanwhile Mr. Lusambo has challenged Mr. Kambwili to tell the nation where he took the railway infrastructure which has disappeared between Ndola and Luanshya.” Where is the Eurobond that was meant for ZR. Why is it that Zambians never ask these simple pertinent questions? The president is in charge, he should expect criticism from everywhere, intelligent, smart, dumb, nonsensical and downright barbaric talk. He cannot escape it. That is what democracy is. Ba Lusambo, God gave us two ears and one mouth! “ so all ministers just continue eating the scraps while they last ; at the end you will be accountable, while I have immunity against prosecution, you have nothing, you will go to jail like Brian chituwo”. The only thing ck calls lungu is a corrupt thief ……if that is an insult , arrest ck or lungu should sue ck for defermation of character or let lungu deny publicly that he is a corrupt thief…..
Ba Lusambo respect is earned. It all depends on how you conduct yourself in public. How could the whole lot of the President jump with joy when someone pointed at him saying: “aba batate nivamene bali na kasaka kandalama??”. The best response every President in their mind could have given to those words is: “no I do not have any sack of money but it is the Zambian people who gave me the mandate to manage the sacks of money on their behalf”. Not jumping with joy. What message is he imparting? The Zambia Police and the Courts should deal with all criminality, and government ministers should mind their Ministries. If CK is insulting the President, report him to the Police, not to the media who in turn report CK or anyone for that reason to us. This lapdog of the President.